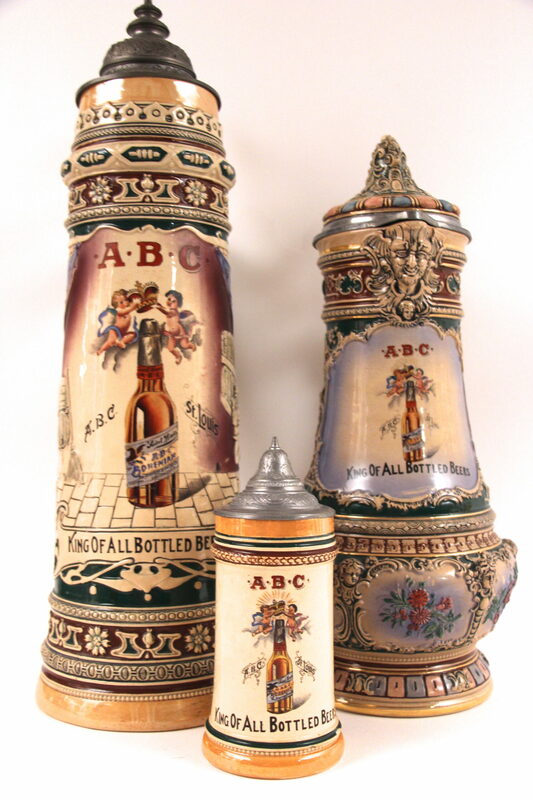 These are three vibrantly-colored coordinating glazed ceramic beer steins with pewter lids produced in Germany for the American Brewing Company (A.B.C.) of St. Louis, Missouri in 1906-1908. All three glazed ceramic steins impressively feature a full-color lithograph design with gold, green, red, blue, tan and black colors. The vivid illustration focuses on two winged cherubs proudly crowning the top of an A.B.C bottled Bohemian beer. 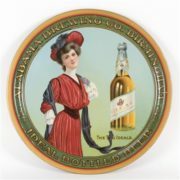 This image symbolized their famous advertising slogan that was etched on the front “King Of All Bottled Beers” describing its flagship brand. The sizes range from tallest to shortest: 21” H x 6 1/2” W (at the base), 16” H x 5 ¾” W and 7 ½” H X 3 ½”W. The bottom of each stein includes the impression mark Germany for its origination. The impression marks also include the number 6 on the smallest mug, number 7 on the largest one, and number 8 on the middle-sized stein. Each number stands for the date the piece was manufactured in: 1906, 1907 and 1908. The largest two steins also have their own model number: 460 for the middle-sized one and 600 for the largest stein. These pre-prohibition steins all have a pewter handle and lid, with the middle-sized one also having an inlaid ceramic design inset into its pewter top. The largest of these steins is a hefty size and was most likely given to saloon owners to advertise their brand in the tavern rather than drink out of it. The other two were used as promotional giveaways. 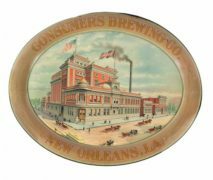 These vintage advertising collectibles are hard to find and considered valuable among Breweriana collectors. There is a fourth beer stein that matches these three coordinating A.B.C. brewery mugs. 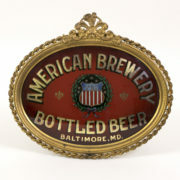 The American Brewing Co. was a prolific advertiser and was marketed extensively around the world in the United States, Mexico, South America, Japan, Philippines, Egypt, and Cuba. 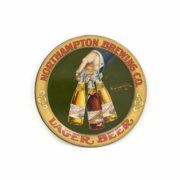 Their beer advertising extended to point of purchase displays, signs, serving trays, steins, clocks, magazine ads, trade cards and postcards. The A.B.C. company publicized in its advertising how they exported beer worldwide. The American Brewing Company (A.B.C.) began in 1890 in St. Louis, Missouri as a family brewery with the Koehler family. The start of A.B.C. actually began with the end of another Koehler family brewery, Excelsior Brewing Company. 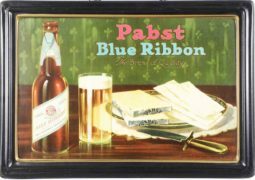 Excelsior originated in 1857 and lasted until 1889 when it sold out to the St. Louis Brewing Association syndicate. 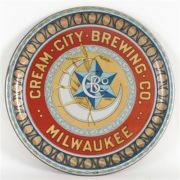 However, the Koehler family quickly returned to the brewery business and soon became an early successful industry giant selling all over the world in the United States and foreign countries. 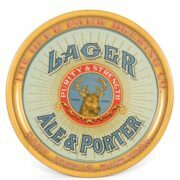 They produced their own malt and specialized in bottling their beer. The company successfully shipped to distant locations in the United States, Mexico, South America, Japan, Philippines, Egypt and Cuba. 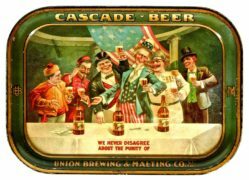 When Prohibition hit the United States from 1920 to 1933, it was a huge setback to large shipping breweries like A.B.C. So for a while, the company produced a brand cereal beverage and soft drinks. As a way to get through the Prohibition era, the A.B.C. Company ultimately fell under the umbrella of the Independent Breweries Company (IBC). 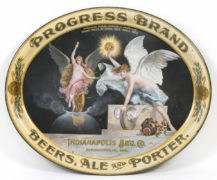 However, once Prohibition ended, the bankrupt IBC saw a chance to sell some of its breweries to regain its investment. A.B.C. was one of them and was sold to a Chicago syndicate. The next several years were troublesome for the A.B.C. brand as it re-entered the competitive market following Repeal. The company filed bankruptcy, had legal woes, reorganized and changed hands a few more times. At one point, the St. Louis A.B.C. 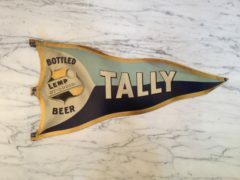 Brand was owned by the Al Capone led brewing syndicate out of Chicago. It was said that Mr. Capone’s “boys” damaged the brewery one night when it was heavily vandalized. The ABC Company eventually went out of business in 1940.